' option. The first drop-down menu is for choosing the front page. You can choose any page here, the front page with the sections should appear as in our demo. In the second drop-down, you can choose your blog page. If you want to take full advantage of the options this theme has to offer, please install and activate OrbitFox Companion plugin. Optimole will automatically compress and optimize all your images, which will improve your site speed considerably. This plugin will let you create all sorts of forms - contact, registration, subscription, payment - with drag and drop. Translate the theme into your native language in a few steps. If you want to easily customize pages and build new templates right from the front-end interface, you can choose between popular plugins like Elementor, Divi Builder and Beaver Builder. * Never installed a plugin before? Check this tutorial to learn how to do it. But these are the steps for configuring the default menu. If you want to create a custom menu and add new sections, check out this tutorial. You can customize the Zelle theme easily by navigating to Appearance > Customize in your WordPress Dashboard. To add the logo of your website go to Appearance -> Customize and click on the Site Identity section. In this section, click the Add Logo button to open the Media Manager. Here you can upload a new image, or select one that’s already in your Media Library. Save and publish the changes. You can also set the Site title, tagline and the favicon in this section. To customize the Big title section navigate to Appearance > Customize > FrontPage Sections > Big title Section. There are two panels in this customizer section, such as Main Content, Parallax effect. The Main Content panel allows you to edit section's content while in the Parallax effect panel you are able to upload two layer images (to experience the parallax effect, the second image should have some transparency in it) and to enable the parallax effect in the theme. If you want to replace the big title image with a slider, you can add your slider shortcode under the Appearance > Customize > FrontPage Sections > Big title Section > Main content section. The video background is a feature only available in the PRO version of the theme. To customize About Us section navigate to Appearance > Customize > Frontpage Sections > About us Section. There are two panels in this customizer section. In the Main Content panel, you can choose if you want to display the section or not and it allows you to edit the section's content. To edit the feature knobs on the right, there are multiple Feature options. To customize the Our Focus section navigate to Appearance > Customize > Frontpage Sections > Our Focus Section. In this panel, you can choose if you want to display the section or not, and to edit section's title/subtitle. And to add the content to this section, you will have to add Zerif - Our Focus widget. 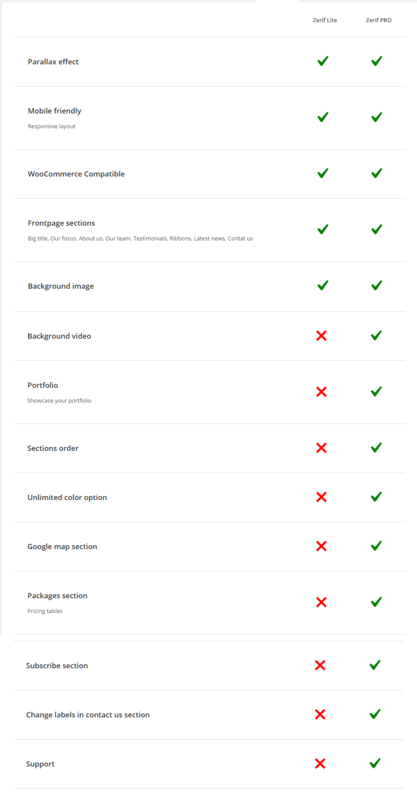 This section can customized from Appearance > Customize > Frontpage Sections > Clients Area. To add the client's logo to this section, you need to add some Zerif Clients widgets here. To customize Our Team section navigate to Appearance > Customize > Frontpage Sections > Our Team Section. In this panel, you can choose if you want to display the section or not, and to edit the section's title/subtitle. And to add content to the section, you will have to add Zerif - Our Team widget from Our team section widgets. To add Testimonials of your clients to your website, you can navigate to Appearance > Customize > Frontpage Sections > Testimonials Section. Here you can choose if you want to display the section or not, or show the Pinterest layout, and to edit the section's title/subtitle. In order to add the testimonials, you will have to add Testimonials widgets from Testimonials section widgets. Zelle lite theme comes with two ribbon sections - BottomButton Ribbon & RightButton Ribbon. To customize them you can navigate to Appearance > Customize > Frontpage Sections > Ribbon sections, and there you can find two ribbons. PS: The ribbon will only appear on your site when you will add some text to it. You need to install WPForms plugin to create a contact form in Zelle Lite theme. After activation, go to WPForms and create a form. To make it easy for you to get the contact form template of Zelle we created a WPForms template that you will need to import into WPForms. In your dashboard navigate to WPForms > Tools, and under WPForms Import click "Select File" and upload the template you previously downloaded, then click "Import". Once the import was successfully finished, you can go and check your forms and you'll see a newly created form named "Zelle". Now copy the shortcode of form and navigate to the " Contact us section" in Customizer > Frontpage sections > Contact us section. There, paste your code in the "Contact Form Shortcode" input, click Publish and you're all set. If you don't want to use WPform plugin, you can add the shortcode of any contact form plugin. You can change the title subtitle and button label from Appearance > Customize > Frontpage Sections > Contact Us Section. There you can configure the email which you want to use to receive these emails. You can add your site and secret keys to enable reCaptcha to prevent spam. If you're unable to receive after configuring your contact section settings, then check this troubleshooting guide. If you need more features for your contact forms such as advanced fields, various templates or multi-page forms, check out WPForms Pro. Latest News section displays your latest blog posts on the front page of your site. You can configure the display settings from Appearance > Customize > Frontpage Sections > Latest News Section. You can choose if you want to display the section or not and edit the section's title/subtitle. In order to show posts in this section please make sure you have some published posts in your dashboard. You can create a post by navigating to Posts > Add New, in your WordPress dashboard. Make sure to add a featured image to your blog posts. The number of blog posts displaying can be configured from Settings > Reading settings. It's 8, by default. To set up the footer of this theme, go to Appearance -> Customize -> Footer Options; here you can add social icons and change the footer content and copyright text. This theme provides some additional features like disable/enable the preloader or smooth scroll. Background image option is also available. You can change the title and sub-title of blog page from Appearance -> Customize -> Advanced Options -> Blog Header Options. Zelle works with translation plugins like Loco Translate. How to translate Zelle with Loco Translate. Note: Only Zelle Pro is having multi-language compatibility with WPML and Polylang plugins. You can upgrade to Zelle Pro anytime to have multiple languages on the website. Why upgrade to Zelle Pro? You have not yet decided between Zelle Lite and its premium version Zelle Pro? Don't worry :) Below, you will find a comparison table with their features. You can easily cancel the yearly subscription immediately after purchase if you changed your mind. If you stop paying after 1 year, you won't receive support and updates anymore, but the theme will continue to work normally. Since you paid for it, the theme is still yours. Upgrading Zelle is very easy, just upload & activate Zelle Pro and you will automatically get access to the extra features. The website won't break nor do you need to reconfigure it. The current price for upgrading is $89 and you get access to all our products (themes and plugins). We know that you might have only 1 site, but we can assure you the deal is worth it. You'll have the peace of mind that, if a new version of WordPress was released or something broke, we've got your back. Our support time for paid users is currently 4 hours, on average. For the Spanish version of the Zelle Lite documentation, you can check out this link: TUTORIAL DE ZELLE LITE EN ESPAÑOL.